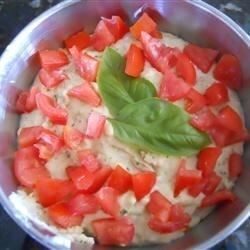 "I made this as an alternative to tomato sauce for a pizza topping, but I think it was even better the next day as a dip. The amount of ingredients I used only makes about a cup, so you may want to double or triple the amounts if making for a party. " Place the pine nuts, basil, and oregano into a food processor. Cover, and pulse 2 or 3 times to finely grind the nuts. Add beans and garlic; process until smooth, about 30 seconds to 1 minute. Pour in the lime juice, tomato, salt and pepper, and pulse 2 to 3 times until mixture is smooth and spreadable. With the food processor running, drizzle the oil into the dip. If mixture becomes too thick, add a tablespoon of water at a time until the dip is the right consistency. Refrigerate at least 2 hours or overnight to blend the flavors before serving. See how to make a simple smoked sausage and white bean chili in just minutes. Big hit at the Chirstmas party! Doubled the recipe due to numbers only complaint was a little to much garlic. Will make again with 1/2 to 2/3 the amount of garlic. Easy and delicious appetizer dip! Good with pita chips and fresh veggies. A nice alternative to hummus. Maybe next time I'll stir in some chopped artichoke. Mmm, this was good after sitting for several hours. I just used it as a spread for crackers. I might try it on a pizza of some kind. I enjoyed this recipe. It was easy to make and the beans could easily be even mushed with a fork. It tasted great on toasted bread or even with baby carrots. I will make this again!